The Best Pinterest Marketing Course! Drive over 170,000 pageviews/mo to your blog or website! Leverage FREE Pinterest traffic. Stop waiting for your dream life and start living it! Get your freedom and make a full-time income online with FREE Pinterest traffic, leads and sales! Are you waking up and going to bed with these thoughts in your head? Gosh, I’ve been blogging for 1 year, where is my traffic!? When will I finally start making money blogging? I can barely find my site’s pages in Google! Facebook and Instagram don’t send any traffic no matter how much time I waste for them! If you struggle with any of these, you are in the right place! I had the same pains, and I learnt my lessons the hard way. Now I’m in a place where Pinterest traffic helped me to quit my 9-5 job and focus on growing my blog and multiplying my online income. I’m getting over 170 000 pageviews to my site from Pinterest a month. I figured out how I can consistently make my pins viral to see these exciting real time numbers in my Google Analytics. Hard to believe, but you CAN have this all sooner than you ever imagined! Dozens of leads every day opting in to your offers and buying your products! I want to be honest, I didn’t start blogging with all the Pinterest expertise I have now. I first struggled a lot to generate traffic from Google and Facebook, I figured I was doing something wrong because things didn’t get better for months. I pinned something to Pinterest but I had no idea what I was doing. Then I decided that as a new blogger I have to focus on ONE thing at a time. And I chose Pinterest as my first and main platform because even when I pinned there something randomly, it was bringing me way more traffic than Google. Since the day I started pinning strategically, experimenting and trying new techniques on Pinterest, my traffic doubled from one month to another! My list of email subscribers tripled in two months. Sounds too good to be true, doesn’t it? 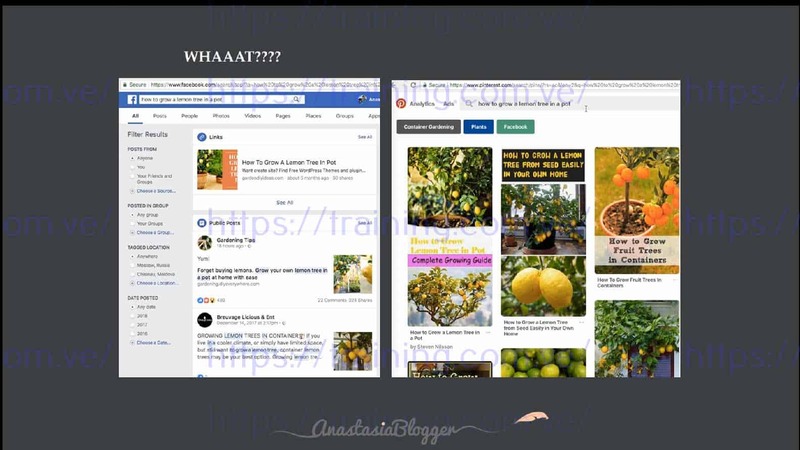 You’re probably thinking, so if Pinterest is so awesome why so many people don’t get great traffic from it, like anastasiablogger.com? Well, first of all, many sites DO get amazing traffic. And those who don’t, they are ignoring the biggest opportunity to grow their online business on totally free traffic which is right in front of them TODAY! The biggest mistake people make, is treating Pinterest as a social media platform. I teach you in my course how to treat Pinterest as a search engine, and how to get your entire strategy based on Pinterest SEO. I give you my own Pinterest hacks and secrets, which you can apply today. But I also show you how Pinterest SEO works so you can start experimenting and “hacking” its algorithm on your own. I started Pinterest SEO Traffic Secrets course three weeks ago, it’s such a short time but Pinterest already has become my main traffic source (about 95%, that’s crazy!). I even managed to get one viral pin – and my blog is just one month old. I’m totally amazed at how fast my Pinterest views are growing. I’m so happy I took this course and didn’t waste time making 300 mistakes which could cost me so much time and effort. As a new blogger, I had no clue what I was doing on Pinterest. I was just adding pins to my personal account before starting Anastasia’s course having no idea how this could help me drive traffic to my blog. Now I have a clear strategy and understanding how I’m going to grow traffic. And my Pinterest monthly views are growing so fast! I'm super impressed how this Pinterest views convert into my blog visitors! There is a lot of material to go through in the course. I'm not yet even half but so far I've learned a lot of new stuff. I'm glad it wasn't the same old rehashed get into group boards, Tailwind, Boardbooster stuff. A lot of the stuff in the course, I've never heard before...I took another course, from a very popular blogger. But it was pretty basic - use Tailwind, Canva, group boards. 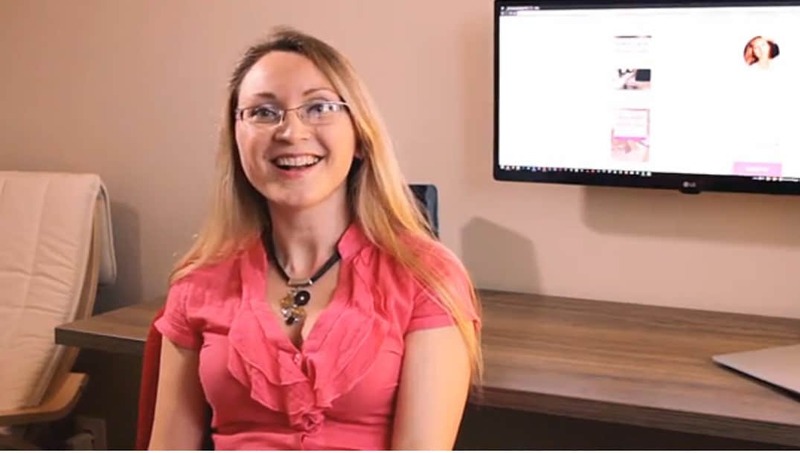 They got into SEO keywords too but nowhere near as in-depth as Anastasia's course. They had just basic SEO like use Pinterest search bar to see keywords. 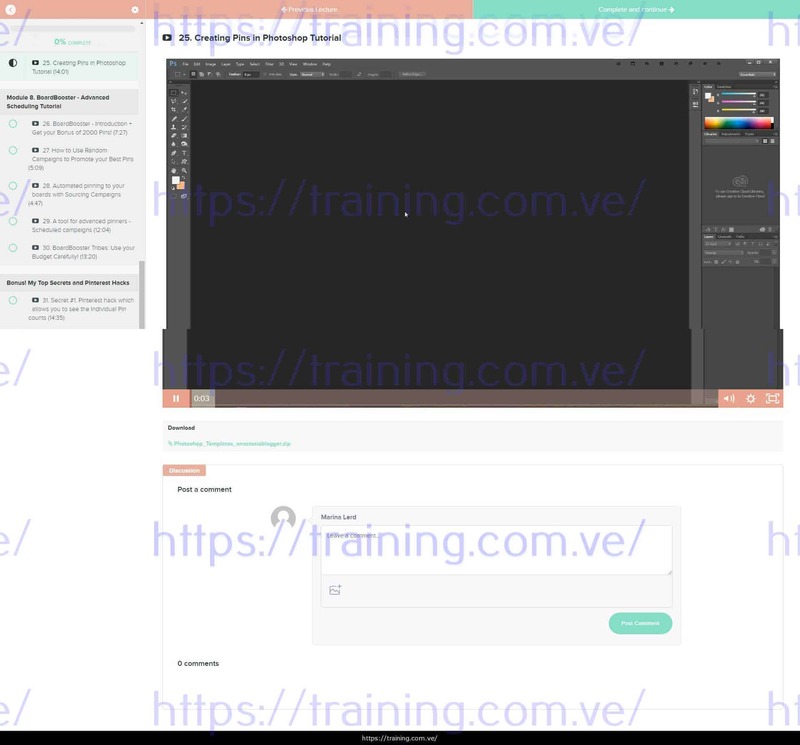 I'm so glad Anastasia's course is not the same old re-hashed stuff... its a lot of info! I have been studying Pinterest for a few months, I have done a blogging course and the author of the course said she was getting 1 million views on Pinterest with her strategy. That course barely scratched the surface and I was really disappointed. Then I literally researched around a hundred blog posts on the subject. After all of this, I studied Anastasia’s course and I can tell you that about 90 percent of the course was completely new to me. Let me ask you a question: if you have a bunch of group boards with 0.1 repin rate, should you keep paying BoardBooster for pinning to those boards? Little details like that greatly influence your traffic. And the course is loaded with details like that. What do you get in the course pack? BoardBooster is my Pinterest scheduler by choice. I tested and built a system which helps me replace 70% of the manual work to achieve my impressive results in a semi-automated mode. It saves me at least 3 hours a day of Pinterest work! All students of Pinterest SEO Traffic Secrets course get an exclusive offer from BoardBooster’s founder – 2000 pins for free and extended trial up to 2 months. When I say exclusive, I mean it. No one else has it! So you can test all the strategies I teach you with Boardbooster. (One thing to note here: you must be a new BoardBooster user to get this bonus). Free updates to the course – Lifetime access! Pinterest is in a constant process of development. Some changes they introduce, will significantly change how you should promote your content on this platform. This course will be updated and all my students will be notified about every significant change on Pinterest – for FREE! This module is something that you’ll never find in any other course because these are my own Pinterest hacks and tricks I use to outsmart the platform and drive traffic and sales to my site like no one else does. I value this module so high because it’s something you can only figure out spending hundreds of hours on Pinterest, testing and experimenting. This is what I do all the time. If you join the course, you will get access to all my tricks as a bonus to the fundamental Pinterest training. Hence the word “Secrets” in the name of my Pinterest marketing course. Grab these Pinterest graphic templates that I’ve designed to help you create viral pins that will stand out. You can customize them with your own text, photos, colors, or fonts in Photoshop and reuse them for multiple pins. I also made for you a Photoshop video tutorial which will help you jump start into using these templates. This is an editable instant download .PSD file and will only work in Photoshop. By the way, you can get a free trial of Photoshop, or it’s available for about $10 a month on a paid plan. Traffic to my new blog skyrocketed in 90 days! I wanted to prove myself that my Pinterest strategy can work for a brand new blog. I created this blog on Feb 4, 2018. In 3 months my monthly traffic to this blog from Pinterest reached almost 74,000 Pageviews! Is "Pinterest SEO Traffic Secrets" the right course for you? You are a Beginner blogger OR an Advanced blogger. 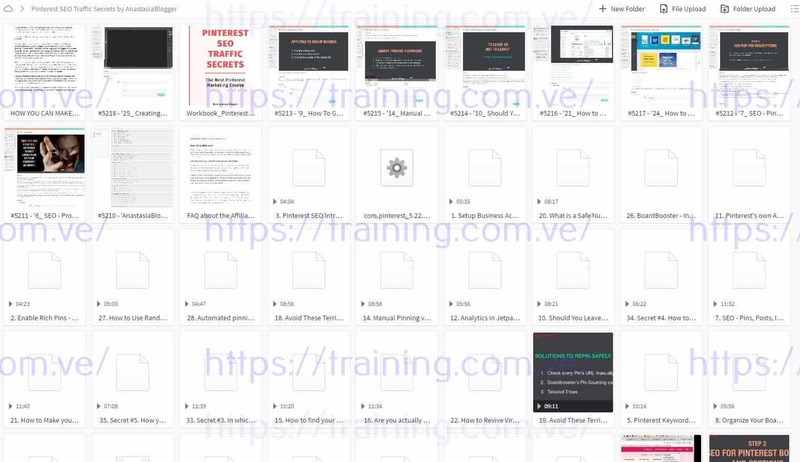 That’s because the course content is designed in a way that can lead you from the basic account settings to sophisticated pinning automation systems. It can teach you to build your Pinterest account from scratch or to fix your account if the traffic has been stagnating for a while. It will help you promote your new content and drive tons of traffic to your old content! If your blog is a hobby and you don’t intend to work hard on it to make a sustainable online income. If you believe in a magical pill which you can buy and get rich quick – this course is for people who are ready to actually invest time and efforts in their blog or online business. If you run an eCommerce website and have no intentions to add a blog or info site to promote. When you think about the price of this course, try to calculate how fast it will fully pay off. If you your main income source currently are ads, you will need just 15,000 pageviews to earn $150 with networks like Mediavine or Adthrive. If you are selling an ebook for $29, to pay off the course, you’ll have to sell just 5 copies! If you sell an online video course or some services for $150, you would need to sell just to one client. You have a lifetime access to the course, as it is on the purchase day, plus to all the updates in the future. This is a never-ending source of Pinterest secrets! Yes, sure. If you complete the course and implement my strategies, but don't see any results, you can email me within 30 days of purchase (a whole month!) for a full refund. In which format the course is designed? The easiest way to learn for most of the people is by watching videos. But I know that workbooks are also very handy as they help to build a solid structure for the course material. You will have videos and a workbook.